I have a crush on a fellow blogger. Her name is Karen and last month (was it only last month?) I stumbled across her newest blog, The White Approach. I knew Karen from Twitter and her original (and also fantastic) blog, AllAboutTheBoys. It was The White Approach and this post specifically that re-started my resolve to get this house sorted. Browsing through the site I realised that 1) we have similar tastes and 2) my house wasn’t going to sort itself out magically. 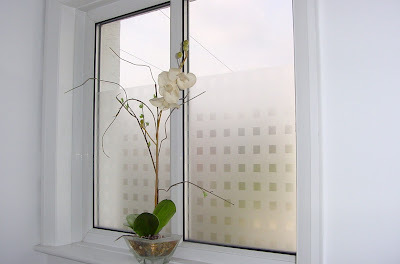 Karen has used window film to really make the best of this hall window, letting light in and adding privacy and as soon as I saw it I knew it was exactly what I needed. Our house is streetside so every man and his dog walks past the window and tends to stop for a gander in (really!) and the back of the house is a private road but you can see straight into both our kitchen windows when the light in on, nets or nets so something had to be sorted! I didn’t want blinds as I didn’t want to lose the light. Karen suggested Purlfrost as a site to nosy at and nosy I did. A couple of days later some samples arrived. Instantly I could see what a difference this would make to my kitchen and lounge and chose the Bloom pattern for both my windows downstairs and White Frost for ultimate privacy in my large bathroom window which faces all the gardens!! You can see just how effective nets have been during the day, night was worse. Really, the photos don’t do the transformation justice, but I am ever so grateful that I found The White Approach, and Purlfrost. This is just one (vast) improvement I have made to my home, which has been relatively cheap but has made it a much nicer space to be a family in. Assuming there isn’t a restraining order, I continue to stalk/look to the White Approach for inspiration and will let you know how I get on. There are big plans for Cawood Castle, a revamped bathroom, spruced up kitchen and more. Maybe when I get the house sorted, I’ll start on the garden – but that is most definitely a post for another day! You can see how easy it is to be seen! What a difference, clean & private!